Copyright © 2012 MRC Laboratory of Molecular Biology. John Sutherland, from the LMB’s Protein & Nucleic Acid Chemistry Division, has won the Origin of Life Challenge. John shares this prize of $50,000 with his former colleague, the chemist Matthew Powner, from University College London. They also receive a $150,000 one-year grant to pursue their research in this field. The Origin of Life Challenge was issued by Harry Londsdale, a retired California chemist and entrepreneur, in mid 2011. He challenged the scientific community to come up with novel ideas for explaining the mechanism of life’s origin. Dozens of proposals were received and evaluated by an international panel of experts. The winners have just been announced by Harry Lonsdale, in collaboration with the Origins Project at Arizona State University and its director Lawrence Krauss. Unravelling life’s origin won’t be easy. Earth was a hellish place when life started some 3 to 4 billion years ago. It was a rocky planet with oceans and a primitive, oxygen-free atmosphere, subject to rampant volcanism and intense solar radiation, with frequent impacts from asteroids and comets. Yet, that was the cradle of life and, as far as we know, the only life in the universe. Somehow life started and, through replication of its blueprint and the extraction of energy from its environment, life gained a toehold here on Earth. 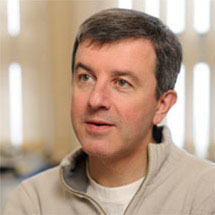 The teams of Sutherland and of his former colleague Powner are focusing on understanding the chemistry of the replication mechanism of first life. All biological replication is based on nucleic acid polymers, RNA and DNA, which carry the genetic code. The two teams seek to demonstrate the selective generation of the RNA building blocks and other key biological molecules from simple feedstock molecules under the presumed environmental conditions of pre-biotic Earth. If successful, the teams will have demonstrated how RNA could have emerged from plausible chemical reactions on the early Earth. The Origin of Life Challenge has also awarded a $90,000 one-year grant to a joint Canadian-U.S. team consisting of Niles Lehman of Portland State University, Peter Unrau of Simon Fraser University, and Paul Higgs of McMaster University, and a $60,000 grant to the team of Wenonah Vercoutere of NASA Ames Research Center and David Deamer at the University of California.